That's it! 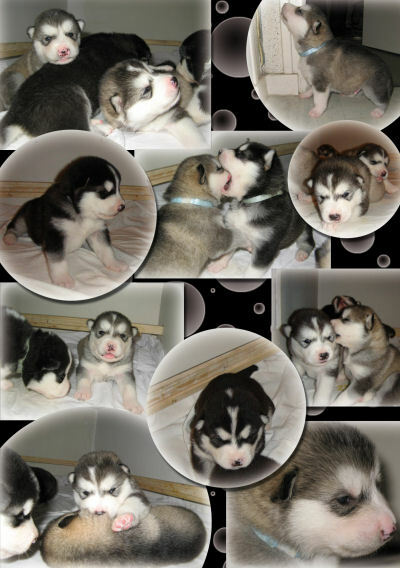 Our Malamute puppies are born !!! We are February 10, 2011 and they are here, 6 male , 2 ashen grey and 4 black and white and 2 females ashen grey. Whelping went well, even if it was both new to Coleen, and to us also !!! But Coleen has done well and is very attentive and sweet good mother. Some puppies seem really strong with a weight of 700 g, the other with a weight of 600 g. All have a nice white line more or less pronounced on the head. The first born was a big ashen grey male with a white line on the head: 680 g on the scale, not bad for the first puppy. He is born at 11h30am and he will be called "Gowind". 15 minutes later at 11h45am, the second ashen grey male appeared, a little less fat with 580 g. This will be the only with no white line on head. He will be called "Grisouille". 20 minutes later, at 12h05pm, the first black male and white with a white line on the head and a small white line on the back is born: he weighs only 580 grams, but he is with a really deep black hair. He will be called "Gandalf". After these three puppies came out very quickly, Coleen pauses and we take the opportunity for eating. At 1h45pm, one more male is born, he is black and white with a large white mark on his head and a white patch on the back. It weighs 610 g. Decidedly there are only males... He will be called "G'aiwok". Finally at 2h30pm, the first female is born. It is ashen grey and weighs 580 g. She also has a white line on the head. She will be called "Guinness". Then at 3h05pm, the second female arrives. Always ashen grey, she also has a white line on the head and is much bigger than her sister: 670 g. She will be called "Shaman (Galtic)". The vet saw 6 pups on ultrasound, but he could not see everything because of too many Coleen's hairs . How many they are really ? At 3h40pm, a male, black and white with a medium sized white line on the head: a strong boy of 715 g. It will be called "Gino". Coleen is tired, but there is still one to go out, and it is the largest: at 16h15pm, a large male of 735 g, black and white with a white line on head leaves after large contractions. It will be called "Guizmo" and he will stay at home. At 21pm, we believe that whelping is completed : Coleen has done a very good job with 8 wonderful puppies, 6 males and 2 females, 4 black and white and 4 ashen grey, all with white line on head as the mother except one. It seems to me they are all very well proportioned and I guess they will be strong, but we must still wait to be sure. No puppy with long hair, it's better for the respect of the standard. At 10pm, it is time to clean all : we change the linens of the whelping box, and I clean the poor Coleen, a small meal, and go for the first night, which was not too rough despite the loud cries of some puppies when they are blocked by mom, or when they are hungry. 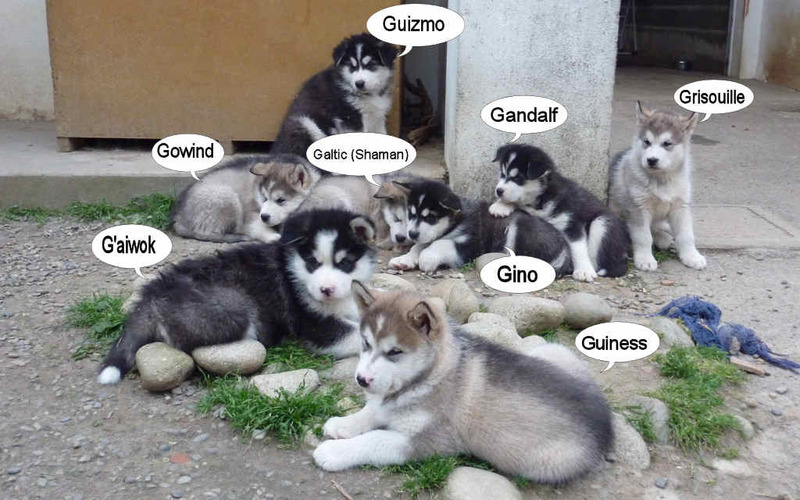 All puppies have been reserved very quickly, we tried to do some selection favoring those who seemed a minimum serious. But it's difficult, because even people who do not know the breed, could become good owners. we have always warned people that a Malamute was a dog a bit special. The puppies were sold vaccinated, wormed, microchipped, with a booklet to get started with your puppy.The birth certificate (pedigree to be confirmed for France) and the new certificate of Ascending performance was sent by the SCC to the new owner, later. It was a great experience, despite the sudden death of the little Guinness, at the age of 2 months, when we thought all the puppies were safe. Despite this great moment of sadness, we have experienced great moments of joy, starting with the discovery of the birth, through the development of the senses, the first outings in the garden with the meeting of adults, first walks outside home during which we created a sensation in our village with our 12 dogs, up to small education sessions to teach them their name and the first orders (sit, ...). The various stages of this litter can be found on the blog. Coleen was a very good mother, she has really good care of the puppies better than what we thought : she spent a lot of energy taking care of them, losing up to 8 kg, she almost never corrected them, she endured all the pack with extraordinary patience. Even today, she is very close to her son Guizmo who stayed at home. Bravo and thank you to Coleen.